This wanton noodle stall is very popular here at this Toa Payoh area, and always have queue during meals hours. The stall is small but is clean and neat. The uncle here is very friendly and fast in preparing the food. 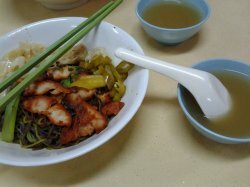 I had their signature wanton mee dry which the noodles are very chewy and fresh, portion is reasonable as well. The char siew meat is tender and not too dry, and the wanton is smooth and the minced meat inside is chewy and fresh as well. The preserved green chilli is also very fresh and crunchy, which is really flavourful and goes well with the noodles. The wanton soup is also fragrant but quite salty. For the price of $4, is still consider reasonable.